Alberta moose hunts include excursions into the backcountry. The terrain in this part of central Alberta is mostly flat, heavily wooded with aspen, spruce, birch and willow forests. Muskegs, creeks and small lakes are prevalent. 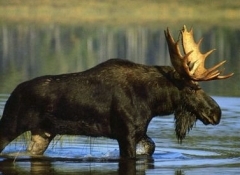 Moose prefer these areas for the solitude, feed, and abundance of water. 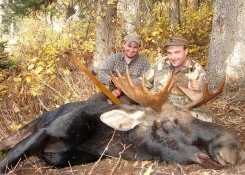 We offer trophy moose hunts in the Freeman River drainage hunting area of central Alberta, Canada. The moose herds are abundant and quality bulls are achievable. You won't find a better place to harvest the trophy moose of a lifetime! 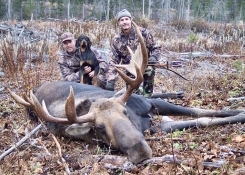 Contact us for more information or to book your next moose hunting trip in central Alberta, Canada. Rut hunts take place from mid-September through October. 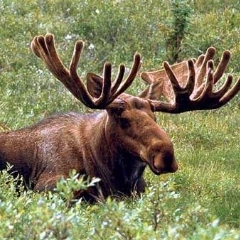 During the peak of the rut, the lovesick bull moose respond well to calling and can be called into bow or rifle range. To have a moose come to call is a real adrenaline rush and makes for a very exciting experience. 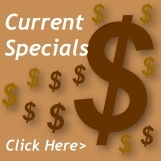 Hunters can combine our moose hunts with other big game hunts, including black bear hunts, elk hunts, whitetail deer hunts, and mule deer hunts. 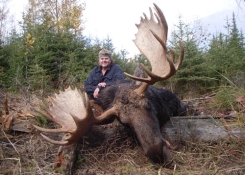 While hunting Alberta's moose, you will be traversing prime big game hunting areas, so why not take advantage and take home another trophy by getting an elk, whitetail deer, or mule deer along with your trophy moose. 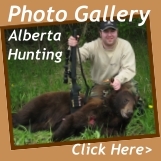 Alberta has a two-bear limit, making our moose / black bear hunting combo an exciting adventure with a great possibility to harvest three trophy animals. 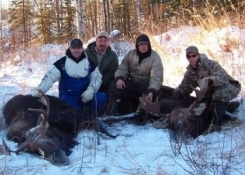 Our Alberta Moose Hunting Adventures are six day hunting trips that can be extended for an additional charge. 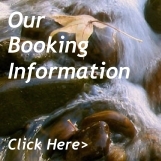 Fees include three meals per day and accommodations at the lodge or backcountry tent camp.